You may be considering using a connector grease, but how do they work? Firstly, we will be focusing on connector grease rather than oil. Grease is mostly preferred over oil for basic practical reasons – for the most part a grease will stay in place where it is applied, whereas an oil will not. A quality connector lubricant does not cause any extra significant resistance/circuit impedance (see how does a connector lubricant works below). Tests on lubricated and unlubricated connectors show virtually no difference in contact resistance. A connector grease is not conductive but is classed as dielectric (not thermally or electrically conductive). A grease does not attract dirt. The grease will act as an environmental barrier but is not polarised in a way that attract dirt. Gold plated will quite often still need a connector grease as the gold plating is microscopically porous and can easily be compromised, especially during initial mating of the connector. A contact surface (e.g. tin or copper) of a connector appears smooth to the naked eye but under a microscope the surface looks like a jagged mountain range – a series of microscopic peaks and valleys. For a connection to be made, these two mountain ranges will come together. 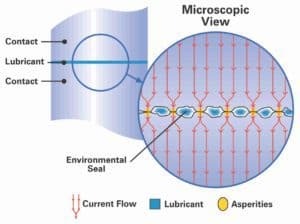 The current only flows where the microscopic peaks touch – imagine the connector as only conducting where the mountain peaks of these peaks and valleys come together; the connector grease will sit in the valleys, away from the mountain peaks (known as the asperities). So to the naked eye it could appear that if a grease is applied between contact surfaces it will be an insulator, but in microscopic terms, a quality connector grease will not ‘get in the way’ of the asperities/mountain peaks, it is squeezed out of the way of the asperities during the mating of the connector. Once in place, the grease will environmentally seal off the contact area, preventing oxidation – preventing air getting to the area so that no surface degradation occurs. Yet another benefit of using a connector grease is that any fretting movement between the contact surfaces is lubricated by the presence of the lubricant. A quick description of fretting corrosion…. Fretting corrosion is the name given to contact wear resulting from low amplitude vibration caused by motion (e.g. a connector adjacent to an engine) or thermal expansion and contraction. Small metallic particles that break off during wear can build up and break the connection. A connector lubricant minimises metal-to-metal wear, protecting the contact from fretting corrosion. Surely a conductive grease is better to use? If you apply a conductive grease, will the next engineer/technician realise it is conductive? Will the correct precautions be taken when the connector is unmated and reconnected? While grease does not migrate in the typical sense, most grease does experience some ‘oil separation’ where some of the oil that is contained within the grease can migrate away from the applied area. If you are reading this article due to a fretting corrosion problem, take a look at our other fretting related articles by clicking on the fretting tag. Get in contact with us for connector lubricant advice or choose your own connector grease at our online shop.